How to Download Favorite Online Videos From Popular Online Video Sites? Convenient and easy-to-operate, Xilisoft Online Video Downloader for Mac provides you the best solution to view online videos and download interested ones instantly and quickly. 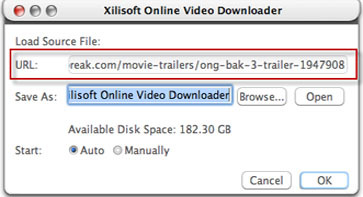 Embedded with a built-in web browser, Xilisoft Online Video Downloader for Mac enables you to visit most popular online video websites in the application and click to download online videos in high speed. Support downloading online HD videos in resolution of 1080P or 720P as well. How to Start a Downloading Task Quickly? How to Download High Definition Online Videos? 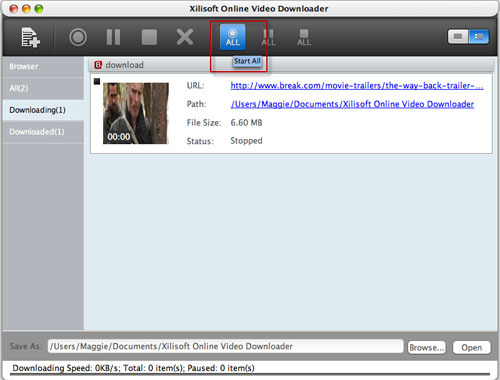 Download, install and launch Xilisoft Online Video Downloader for Mac. Click the corresponding logos of online video sites to log on the homepage of these sites. You can also select sites from the dropdown list on the left toolbar. Click the video thumbnail to open the web page in the embedded web browser and watch the video online. Click the “Download” button on the toolbar of embedded web browser to start downloading your favorite online videos. Check the status of downloading or downloaded tasks in “Downloading”/”Downloaded”tab on the left panel. Xilisoft Online Video Downloader for Mac provides two view modes of the tasks: list and thumbnail, you can switch between these two modes by click “List/Thumbnail” button at the top right corner. 1. Click the “New Download” button and enter the URL of the video to start a new downloading task. You can also click “File” button in the main menu and select “New Download” option. Enter the URL of video to initiate a new downloading task. 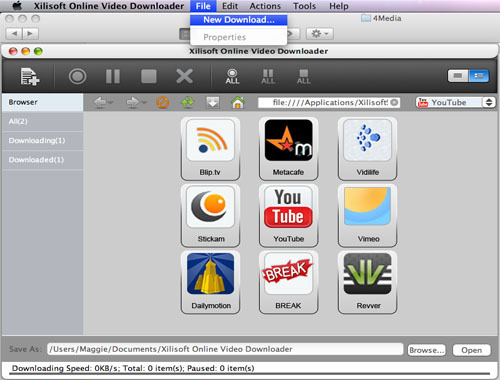 Xilisoft Online Video Downloader for Mac allows you to download High Definition online videos from the sites. Just browse the online video you like and select 1080P or 720P on the dropdown list of resolutions. Manual mode and auto mode are available after initiaing a new downloading task. You can set the downloading mode in Tools=>Settings=>Tasks=>Start Type. If you select Manual mode, you have to start the downloading tasks manually in tasks list under “Downloading” tab.